The Bridge of Sighs. The Ponte Vecchio. We all know at least one bridge that makes us long for Italy and its beautiful views. That’s why we love this list of 16 Italian bridges via The Local. If you’ve wanted a new perspective on your Italian travels, this could be it: Why not try out some of these crossings, working them into city visits and country treks, too? The list begins with Verona’s Ponte Castelvecchio, a superb medieval brick creation that has been fully rebuilt after a World War II bombing. It continues on with the Ponte Sant’Angelo in Rome and its once-dark purpose as a prison, all the way to the world’s longest Tibetan rope bridge in Clavetere, a two-hour walk that will keep you on your toes (pun very much intended). If you’ve already visited all of the bridges on The Local’s list (we bet you haven’t! ), take a look at this list from Ranker of the most famous bridges in Italy. Remember, in Venice alone there are 391 bridges, crossing 150 canals and uniting the 117 or 118 (no one seems to be able to agree) islands the city is built on up to now. You could spend over a year crossing one bridge per day and still have more of Venice’s waterway views to see—and if you had the time to do so it would probably make an excellent pursuit. Of bridges, Italian writer Erri De Luca, himself once a bricklayer, said: “The Bridge is the only building work that is generous and social (cordiale). 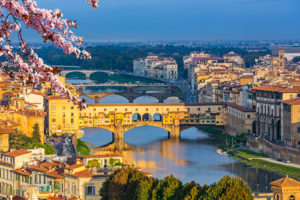 Instead of dividing [like walls], it wants to unite, to connect, to span over rivalry.” Given Italy’s fascinating history and complex unification, bridges have meaning in the country spanning everything from commerce to politics to culture.